The interests for education loan are high. Thus candidates belonging to poor, backward and minority communities find it difficult to pursue their dreams. The central government will assist the meritorious students by providing subsidy on the interest of the education loan via Padho Pardesh Scheme. Educational welfare for minorities – The main objective behind the creation of the scheme was to assist the students belonging to poor and minority communities to acquire loan at subsidized interest rates for educational betterment. 100% subsidy on the interest rate – The interest rate on the educational loans is high. So, many students cannot afford these credits. With the scheme in place, the students will get 100% subsidy on the credit. Covering the course duration – Another feature of the scheme is that the students will have the benefit of subsidy for the entire period of the course. Thus, they will be able to concentrate on the course. Partial courses are also included – There are many courses that are taught in parts, i.e. a certain section is taught in India and the rest is taught in foreign lands. As long as the degree is provided by the foreign university, the candidates will get the subsidy. Number of beneficiaries – Till date, the program has proved to be beneficial to 1343 students. These candidates fall under the minority community and have received admission in foreign universities. Must be of recognized minority community – The main criteria that the candidate will have to fulfill is that he/she needs to belong to the minority community. Christians, Muslims, Sikhs, Jains, Buddhists, and Parsis are all included in the list. Loan sanctioned after 2013 – 14 – All credits that have been sanctioned after 2013 – 14, will only be considered eligible for the subsidy scheme. Must get admission in a recognized university – All the candidate who are willing to avail the benefits of the scheme must have acquired admission in a recognized foreign university. Must seek higher education – Only those candidates who are pursuing masters, M.Phil, Ph. D, MBA and other courses of this level will be allowed to get the subsidy on the interest rate. PG Diploma courses are also included in the list. Must fall within an income slab – Only those candidates will get subsidy on academic loans that have a yearly family income of 6 lakhs or less. Crossing the mark will cause the rejection of the application. Must be sanction from an enlisted bank – The candidates will be able to apply for the benefit is the loan has been granted from a bank that has been enlisted by the central government. Loan amount bracket – Only those candidates will be able to enroll under the scheme who has taken an education loan that is not more than 20 lakhs. Must be a citizen of India – Last but not the least, the candidate who is willing to get the benefit of the scheme must be a legal citizen of the country. Loan amount – According to the rules of the program, any minority candidate who has acquired a credit of 20 lakhs or less from any Indian bank, for meeting the requirement of education from a foreign university, will get to apply under the scheme. Rate of interest – The student will not have to pay the interest for the entire period of the course. They will also get a buffer period of one extra year and six months, once the course is over and they have managed to bag a job respectively (whichever before). Once this time is over, the rest of the interest and the main credit amount must be paid. Repayment – The amount is to be repaid by the creditor only after the course has been completed. Mode of Payment – All payments will be done in the account of the student. The student can opt for internet banking or use cheque for acquiring the loan amount. They will have to repay the loan and interest in the same manner. It has been highlighted, than any candidate who is fulfilling all the requirements under the scheme, will be entitled to get a subsidy of 100% on the interest of the education loan, for the entire duration of the course. Loan application form – The first document that all candidates will have to provide is the application papers of the credit. The form will be provided by the respective bank and all other documents must be attached with it. Aadhar card – For the verification of the name, age, address, etc, the candidate will have to attach a photocopy of the Aadhar document. It will also contain a photo of the candidate. Course and admission papers – To support the claims of higher education, the candidates will have to furnish the papers showing successful admission in the foreign university. Other course associated papers must also be provided with the form. Income certificate – As there is an income specific criterion, the candidates will have to furnish an income certificate to support the claims. 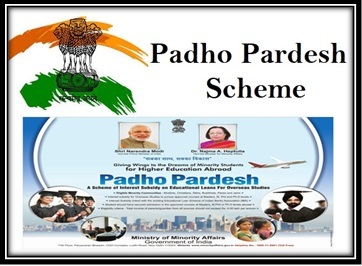 Minority certificate – The scheme has been designed for the development of the minority communities. Thus, furnishing the minority community certificate is a must. Bank account details – The monetary transactions will take place via the bank accounts. Thus, furnishing the details of the account is also essential. It has been mentioned in the draft that the subsidy is linked with the Indian Banks Association or the IBA. Any Co-operative Banks, Private Bank, Scheduled commercial Bank, Public Sector Bank; etc which is associated with the IBA will be permitted to sanction a loan under this scheme. The procedure can only be started once the candidate has acquired the admission into foreign university. With the admission papers, the candidate must approach the bank of his or her choice that has got the approval of the IBA. The banker will provide the education credit documents. After filling the loan documents with required data, all important papers must be attached to the form. Once the form has been filled, it will be sent to bank headquarters and then to the respective Department of the Minority Welfare for documentation. As per the reports of the government, the central authority has already allotted a whopping budget of Rs 7.50 crore. With this money, the government wants to extend a helping hand towards as many students of minority community as possible. Sir,i have an offer letter from ROYAL MELBOURNE INSTITUTE OF TECHNOLOGY (RMIT) for masters in manufacturing engineering.I am applying for loan in HDFC Credila,the are saying that they can’t have padho pradesh scheme.what should i do now? Or they can give me loan on padho pradesh?